As the past few 2MinTT Reviews will undoubtedly show, my family and I have become completely obsessed with the new(ish) line of Lego board games. We finally ventured out from beyond the $10, cheaply invested games, and splurged on one of the more extravagant, expensive sets: Harry Potter’s Hogwarts. After giving “Shave a Sheep” (which has FINALLY seen a release here in the States, though under the name of “Wild Wool,” presumably because PETA would cry wolf at the original name) a go, as well as “Magikus,” I finally let my soon choose a more robust, engaging game. 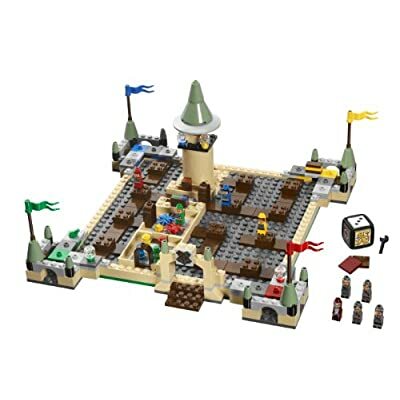 There are a few >$20 to choose from in the Lego board game series, and I should have known he would choose the one sporting a wizardly cast of minifigs all trying to navigate spirited stairs. The game comes with a large amount of pieces to build, and this does take some considerable time, depending on who’s doing the building. My 5 year old always assists in the Lego builds. He always dives straight for the minifig pieces when we dump them out of the box, but I also have him build the repetative sub-parts (such as wings, wheels, panels, etc.) that I get drearily tired of after build #2 of “x8.” In this case, it was the moving stair cases that I put him in charge of, while I built the frame of the Hogwarts Academy. 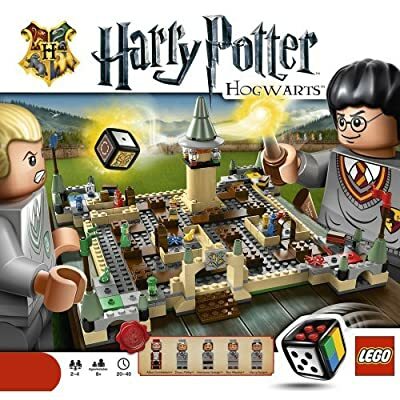 Definitely put aside time the first day to build this, as you won’t be playing within the first 30 minutes of opening the box. We built it in the afternoon, took a break for dinner, and came back to play a quick round before bed. So, how does the game play? The best way to describe it is as an interactive sliding puzzle. You’re in charge of a Hogwarts’ student, who needs to collect 4 items to assist in completing their homework (a potion, a familiar, a crystal globe, and a spell book). In order to move, you must shift and rotate stairs (the story following the infamous floating stairs from the novels) to allow your character to move. You roll the die, and depending on the number that appears, you can shift the stairs that many times, then move your player one spot. Should you roll a rotate icon, you can rotate a set of stairs in any direction. A secret passage icon allows you to “jump” across floating stairs that don’t connect. Your goal is to make it into each room, get the item for your homework, and be the first to collect all four. As with all the Lego games, it comes with a few ways to play an advanced version, once basic gameplay tires. Since it’s a game of chance, game time can vary from 10-45 minutes. Your games will go much longer should you attempt to play the spoiler on a turn, and rotate or shift stairs not for your benefit, but at the behest of your opponents. While complicated the first few times, my son definitely started to understand the multi-step thinking involved, and has actually hit a win streak of 5 in a row at this point. This is simply one of the best games in terms of getting children to think. We play a lot of chance games in our family for those days when we’re completely brain fried (or brain hungry), but I really get excited for games that get kids planning and plotting. There’s nothing more enjoyable than seeing the evil glint in my son’s eye as he shifts 3 rows of stairs that not only let him enter a room, but completely block me from my carefully planned objective. He’s evil, but purposefully so.